Kayla (my fourth grader): We are learning about adjectives in school this week. Me: So tell me what an adjective is. Kayla: (long pause) A person, place or thing??? Brooke (my second grader): No, that's a noun. And I know that a verb is an action word. Me: Kayla, you learned about adjectives way back in second grade. You remember what they are, don't you? Kayla: Hmmm... I can't remember...adjectives are hard! Parts of speech.. so difficult for so many kids! As a teacher who has worked with all elementary grade levels, I know that most kids have trouble retaining what they learn about parts of speech. Fourth and fifth grade teachers, don't you find that you always have to start over and review (a lot) all parts of speech before you can get to the new ones introduced at your grade level?? 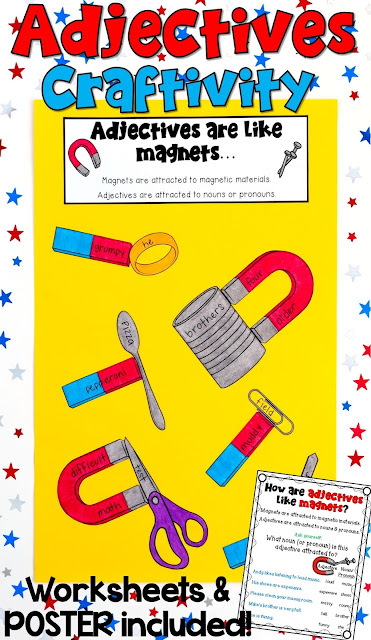 I can tell you that there was a point when Kayla was in second grade and in third grade when she could tell you exactly what an adjective was, and identify an adjective in a sentence! But... time passed and she obviously forgot what she learned! When I teach this lesson in a classroom, I plan to create the above anchor chart prior to the beginning of class. I will tape it to the board, and then tape up the bottom so that only the question is displayed at the beginning of the lesson. I think it would be interesting to have students answer this question themselves. They may come up with some connections that I hadn't considered! After a brief brainstorming session, I would remove the tape from the anchor chart and reveal the rest of the information, and discuss the connection that I came up with. Then, I would have students help me find the adjectives and the nouns/pronouns they are attracted to in the example sentences on the chart. Now is a time when I wish I had a classroom so that I could teach this lesson and find out if the connection will be meaningful for students, and help them with long-term retention. What do you think? 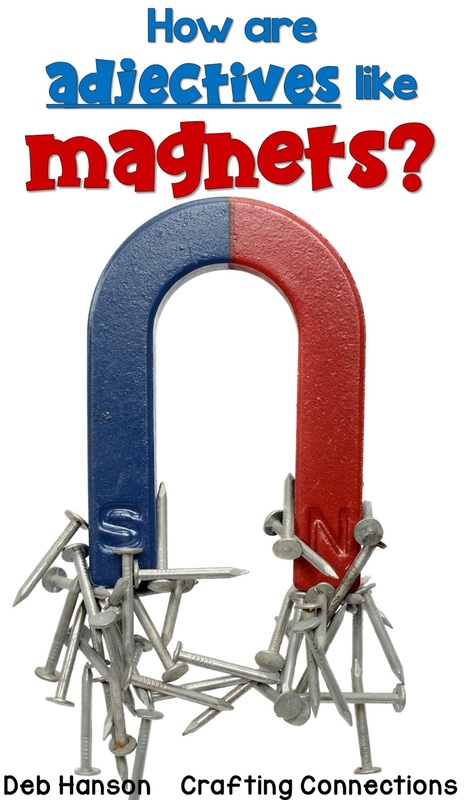 Will the mental connection of an adjective being comparable to a magnet work? If any of you try this approach with your students, please let me know how it goes! In fact, I created a matching craftivity! If you don't want to recreate the anchor chart, you can use the teaching poster that I created for the craftivity file. Students complete the above worksheet (the file includes another worksheet page, too), and then use their answers to assemble the craftivity. 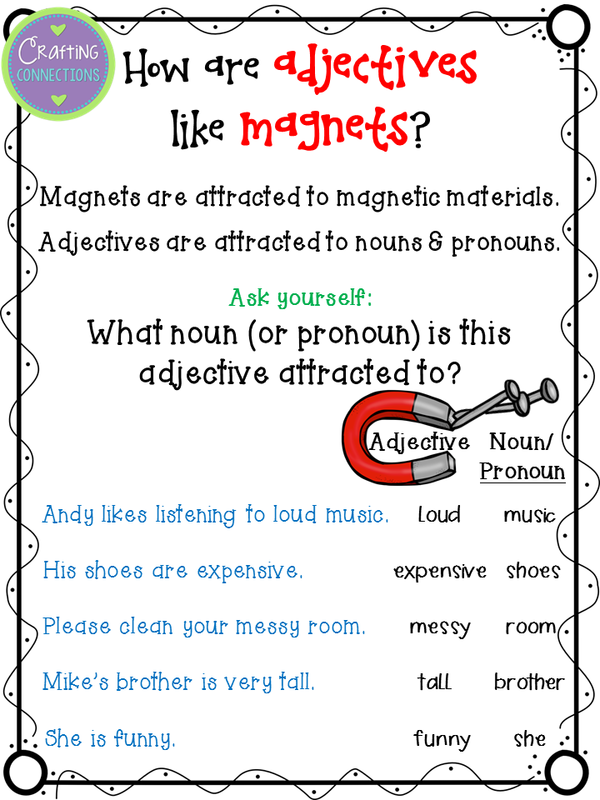 Love the magnets idea for adjectives. Thank you! WOWZA! I had seen the activity offered on TPT and had put it on my wishlist. Santa came early! THANKS SO MUCH! 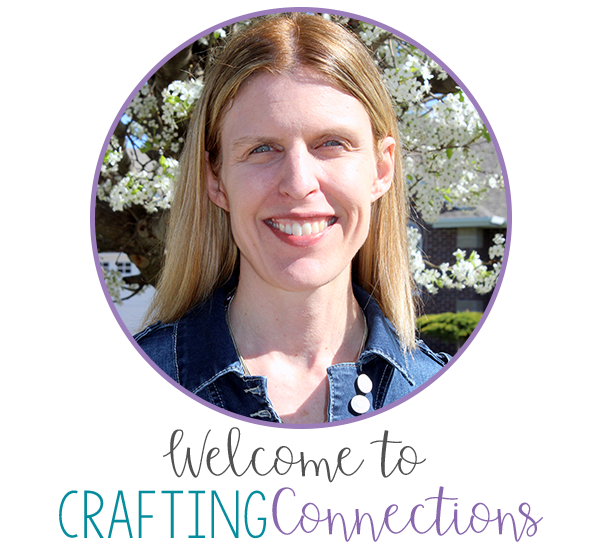 Your craftivities are the best!